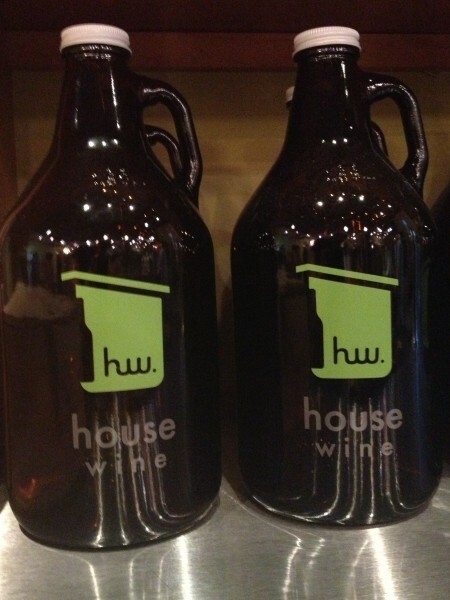 With a name like House Wine, you might not naturally expect an establishment with a strong beer offering. House Wine has served Old Worthington since 2007, when owner Donnie Austin made a splash by opening the first wine shop in Ohio to employ the clever and practical Enomatic (automatic, swipe-card driven) wine dispensers. While House Wine has offered an impressively curated selection of beer for several years, Donnie has recently endeavored to further emphasize craft brews by showcasing it alongside his wine selections. Jim recently interviewed Donnie to find out more about this new development at his shop. How has the response been to the expansion of beer options at House Wine? It’s been very positive, as we expected, since we already had a large base of beer costumers. And now we’re attracting even more of the beer geek crowd. We feel like it hasn’t interrupted or interfered with our main mission of selling wine to enjoy at our shop or take home. We opened up with a selection of craft beer by the bottle with a focus of American breweries only. A few years ago, we added three taps, and over time, increased our bottle to selection of 100+ beers. The jump to 12 taps has been a natural migration for us, offering our on-premise customers good beers to enjoy at our shop or the ability to take home growlers. We’ve had a similar approach with beer as we do with wine – offer our customers value and a retail experience that’s unique, relaxed and enjoyable. We’re competitive with the alternatives for wine and beer but feel like we can offer more as far as service, beer events and environment. Many people know you as a wine enthusiast, but you have a long history in beer too. When did you first find an interest in craft beer? I’ve been drinking beer quite a bit longer than wine. That’s what college can do for you, especially due to the price point for beer. I drank domestic beers (after I was 21 years old, of course) before getting turned onto Sierra Nevada Pale Ale and then I was interested in trying different things. I didn’t really care for too much of what was available, especially in Indiana, but then got a major hook when I first had Bell’s Two Hearted Ale on draft in Indianapolis and then it was soon available in Ohio. The difference with beer versus wine is that it’s affordable, there’s a consistency with the products when you want to know what you’re getting into, and good beer can be made basically anywhere with a good water supply. Do you have a favorite style of beer? I’m across the board stylistically and it’s often based on my mood. I’m more into the hops and yeasts versus pretty malty beers. Belgian-style Wits, Saisons and Golden Ales. German-style Pilsners. And sometimes I just want a moderately hopped IPA. I try to avoid the beers that are three or four styles bridged together just to be unique because I like to connect with the identity and personality of the beer. What advice do you have for people that are new to beer (or wine)? Taste and try different things and don’t let someone tell you what you should like or don’t like. Your palate and preference knows best. Some people want to go their entire life drinking Bud, Miller or Coors and it’s like only eating meat and potatoes. More power to them and that’s a large portion of the beer consumers, and there’s also a place for these beers with all beer drinkers. But the rest of us like the adventure and trying different things, sharing and talking about them. Can we expect to see any additional expansion of beer at House Wine? We look forward to broadening into more non-American craft beers as well as varying up our beer tastings and events. At this point, we feel like we have a wine and beer offering that will take care of almost any customer, whether they’re buying for home or wanting to enjoy a glass of wine or a pint at our shop. Housewine is great for beer and wine! We have one of the wine club memberships but regularly find ourselves spending time looking at the beer and we usually make a 6 pack to-go in addition to picking up our wine! Now they have several taps on draft and have regular beer tastings. Love them!